Tasty dessert dishes transformed by the renowned french pastry chef, Mr Meringue pairs the sweet tastes of meringue and delicious summer fruits. These masterpieces are created by the high standard mixology found at the Charlie Chalk dust lab. The buttery and bright dessert treats by Mr Meringue deliver sensations of flaky pie on the inhale with hints of lemon and cream on the exhale. 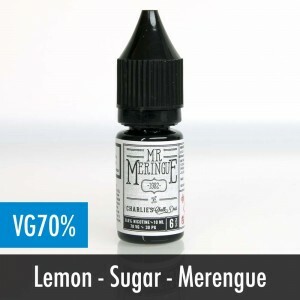 This delicious lemon meringue will easily become one of the well seasoned vapers favourites.